If you've ever steered away from adding grey to your colour scheme and interior, now's the time to reconsider! Grey gloss is a great alternative to white; it still has all the same material qualities but with the added benefit of being a slightly warmer tone, making it ideal for enhancing a range of interiors. A really effective way to include grey in your interior is though stylish pieces of furniture, such as the Zen 6 Seater Grey Gloss and Oak Dining Table. Part of our Exclusively Danetti with Julia Kendell range, this dining table is sure to bring a touch of style and comfort to your mealtimes. A subtle but effective design feature of this Zen table is the engineering of the frame. The legs are a V shape with a cross bar at the top, rather than just poking out from underneath the tabletop. This keeps the tables simple appearance in an elegant and thoughtful way. 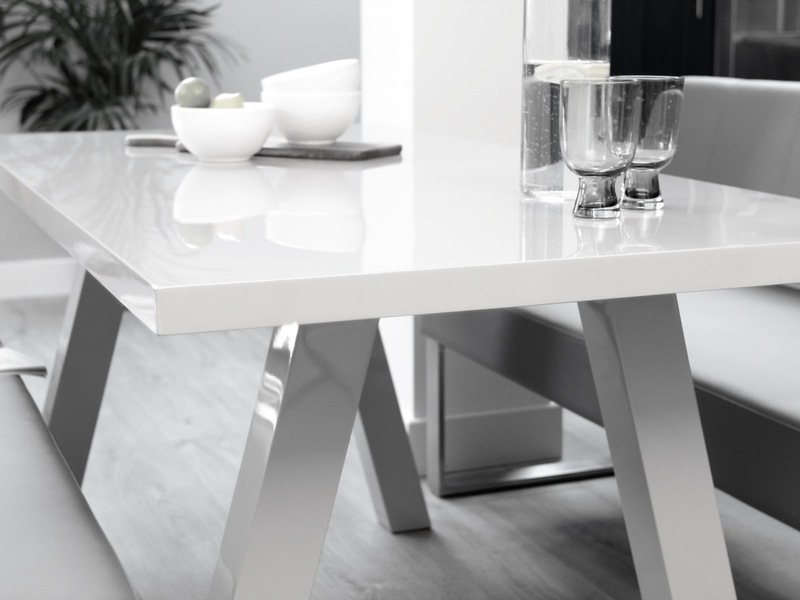 Adding the underframe gives this modern dining table a stylish design feature alongside a ton of extra support and stability. We use a high grade of MDF as part of our brand commitment to always providing products that are as safe as they are beautiful. This is so you can buy our products with absolute security and confidence, knowing you are using the safest materials around you and your family. 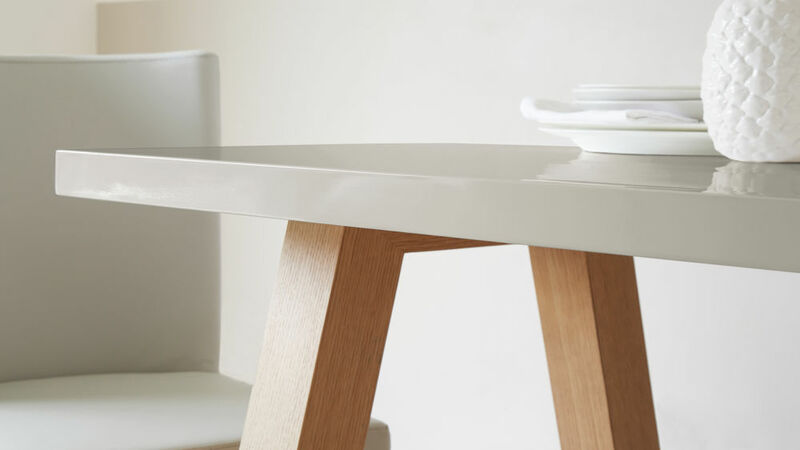 The oak and grey gloss finishes on this table have been carefully considered, with the idea of bringing a sense of contemporary design and warmth to your dining area. Mixing a grey gloss finish with an oak veneer is a great style choice as the grey gloss adds an on trend and modern spin to the more traditional appearance of the oak veneer. The application of the grey gloss finish is a multistage process involving 3 coats of gloss, each dried for 24 hours. The table is then polished, by hand, for a highly reflective shine. It's this layering process that gives the grey gloss finish its depth and durability. 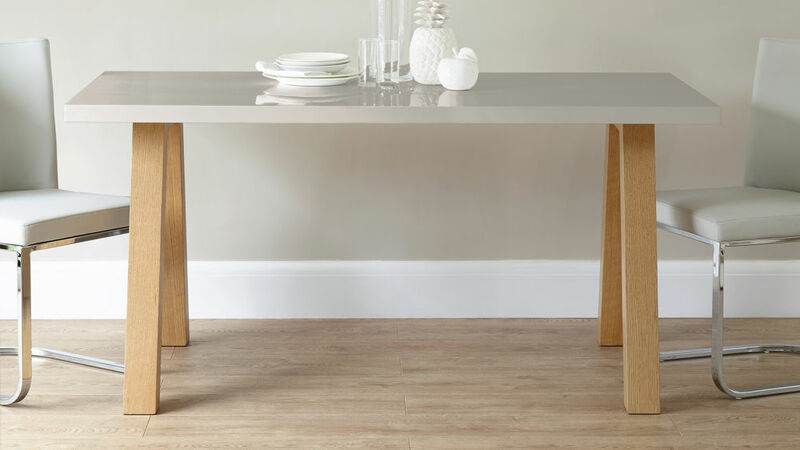 This Zen 6 Seater Grey Gloss and Oak Dining Table is a modern spin on an classic trestle style table, updated to be more practical for modern family homes. If you like the style of this piece, take a look at the Zen 6 Seater Oak Dining Table or the Zen 6 Seater White Gloss and Oak Dining Table, both in the same design but with different finishes. All of the tables are part of our Exclusively Danetti with Julia Kendell range.